Personal Insurance Stittsville: Why Work With An Insurance Broker? 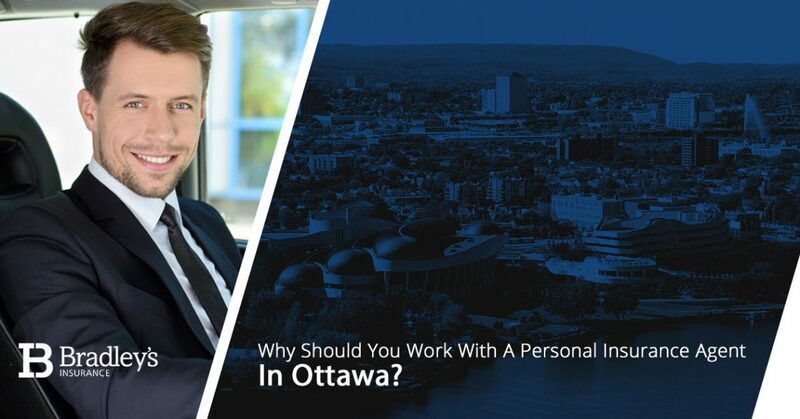 Why Should You Work With A Personal Insurance Agent In Ottawa? Does it pay to be protected? We think so. Insuring multiple aspects of your life — as many as you can, really — is beyond important. However, with so many insurance providers out there, trying to find the best company who offers the best deals on their policies might very well make your head spin. Indeed, it seems as if the insurance industry has become saturated with time-a-dozen providers, offering similar deals on their policies that may or may not be an ideal fit relative to your life situation. Without being an insurance expert, how can you really know, let alone trust, that a personal insurance policy is the right option for you? That’s a fair question, and a question that our Ottawa personal insurance brokers value here at Bradley’s Insurance. You’ve worked hard to earn what you have. Whether you have valuable personal assets like a boat, RV, snowmobile, seasonal property or other toys, you’ll want to make sure that these items are financially protected in the event of accidental damage or another unexpected mishap. However, is it really worth stressing yourself out just to get the peace of mind that you (and your family) deserve? Struggling to find a personal insurance policy that works for you just doesn’t make sense. However, working with one of our personal insurance brokers in Ottawa does make sense, and we’re going to let you know why below! Bradley’s Insurance home and auto services are two popular personal insurance services that we offer, connecting you with the right insurance companies that we work with. Going beyond home and auto insurance in Ottawa, we’re also proud to help our fellow Canadians get fantastic deals on classic car insurance, condo insurance, high-value home insurance, water loss insurance, and so much more! If it’s related to your personal life, we can help you get covered and stay covered. Read here for more insight into our personal insurance brokers, or feel free to contact Bradley’s Insurance to learn more about how we can help you save money on protecting the things you love. We take all of the hard work and guessing out of the equation for you. Again, as we briefly mentioned above, why stress about something that’s designed to lower your stress levels by providing you with that much-needed financial protection? It just doesn’t make sense. Without the expense of comprehensive coverage, one of our independent insurance agents in Ottawa and our home in Stittsville will help you save money on just about every personal insurance policy that you could imagine. Bradley’s Insurance is a people-centered business. We’re small and personal, but also large enough to work with some of the best insurance providers around. For you, that means getting the best of both worlds. Devoid of any sort of call center, we’re proud to talk with our valued clients directly on the phone every single time. Who really wants to talk to a robotic, automated voice recording when you can talk to an actual, breathing human being? Whether you have legitimate questions about your policy or you need to report any type of claim, our team is here for you time and time again. Directly speaking with one of our friendly representatives also means that when you do need to file a claim, you can file it correctly the very first time. While the need to file a claim is unfortunate in and of itself, accidents happen. It’s best to move forward quickly in these types of situations, and having an insurance agent who can help answer any questions about your policy is extremely useful. In fact, it’s so useful that some of our valued clients wouldn’t know how to file a claim without the help of an expert! Knowing exactly what your policy does (and does not) cover is absolutely essential to file an accurate, detailed claim. If you’ve always wanted a personal shopper without the exorbitant price associated with a personal shopper, then voilà! Similar to how a car salesman helps you navigate different vehicle models to find the ideal fit for your needs, or how a dedicated real estate agent will drive you to multiple properties to find your dream home that fits your budget and lifestyle, we’re the insurance equivalent. Indeed, the team at Bradley’s Insurance will review the going rates of several different insurance companies and their corresponding coverage options in order to help you find specialized policies that best fit the things that you own and the things that you’re into. Working with an insurance provider located in a different province — or even in a different part of the world — just doesn’t make as much sense as working with an independent personal insurance broker who’s located right here in your hometown. Our knowledge of the ins and outs of Stittsville and the greater Ottawa area is beneficial to you as a policyholder because we know some of the specific details and factors that might affect your policy. Without a physical presence in the area, other insurance providers might not be aware of these things. Additionally, Bradley’s Insurance also believes in the value of giving back to our community. Whether that’s through volunteering, sponsoring fundraisers or local sports teams or even serving as a board member for a local nonprofit organization, our commitment to the success and development of the place we’ve spent so much time living in is beyond important to us. Read more about why Bradley’s home and auto insurance services have won over the trust of Stittsville and Ottawa for decades. From common insurance services like Bradley’s home and auto to niche commercial insurance policies like laundromat insurance or convenience store insurance, we can help you find coverage for just about everything and anything that you’re looking to cover — period. Plus, you can also reap the money-saving benefits of bundling multiple insurance policies with us. Home and auto bundle insurance in Ottawa is a common insurance bundle option, but there are plenty of bundling options for you to take advantage of. Bradley’s Insurance provides ourselves on our reputation. We’ve faithfully served Stittsville and the greater Ottawa area for decades, and we’re not leaving. Given how long we’ve been firmly established, our commitment to providing excellent insurance services is not only a testament to our loyalty but also a testament to our financial stability. Wouldn’t you rather work with a local business that’s genuinely recommended by trusted friends and family members? People will go above and beyond to share a phenomenal experience with a company, and Bradley’s Insurance values this fact. Learn More About Bradley’s Home and Auto By Visiting Our Stittsville Office Today! If you’d like to learn more about our family-driven values as Ottawa’s premier personal insurance broker, we’d love to chat with you! Discover the benefits of working with our independent insurance brokers today by getting in touch with Bradley’s Insurance.